Field Essays is my personal tribute to design processes. At the same time it is an attempt to emancipate our understanding of design by claiming space for critical action and reflection. It asks what happens if we start to look at design processes as autonomous spaces, with their own behaviour and nature. This first issue is devoted to the work of LucyandBart, an ad hoc duo from Amsterdam/ Eindhoven. Central to their work is the question of how behaviour shapes the ways in which our body interacts with the world and vice ve,rsa. In their absurd human enhancements, skin performs as an intimate interface with the material world. The instinctive, er’ratic, and at times even trivial nature of LucyandBart’s process is hard to decipher, especially because it refuses to be understood, labelled, or contextualised. “When you blink it moves”;it is only through such seemingly matter-of-fact observationsthat the motives behind their ambiguous imagery can be detected. 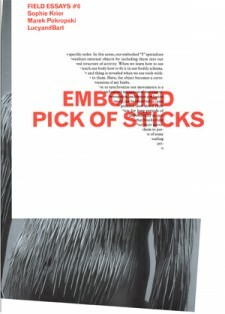 The idea of embodiment is explored from a phenomenological angle in Marek Pokropski’s essay, a study of how our bodies continuously mediate the world around us. The question of the borders between self, body, and sunounding, and how these three domains collapse in the dynamic system of behaviour, drives Pokropski’s analysis. Related thoughts and references, side observations and tentative conclusions are orchestrated in a series of Notes, and inserted now and then. Transcribed conversations between Pokropski, LucyandBart, and myself connect the different ideas that inhabit this issue. I want to thank LucyandBart, Rene Put, Andreas Tscholl, and Jeroen Boomgaard for their sustained and generous commitment to this adventure; Field Essays would still be a mere concept on paper without their support. Many thanks also to Freek Lomme, Renee Kool, and Willem van Weelden for their crucial feedback at critical points in the process. Published in: Field Essays #0, Onomatopee 55.